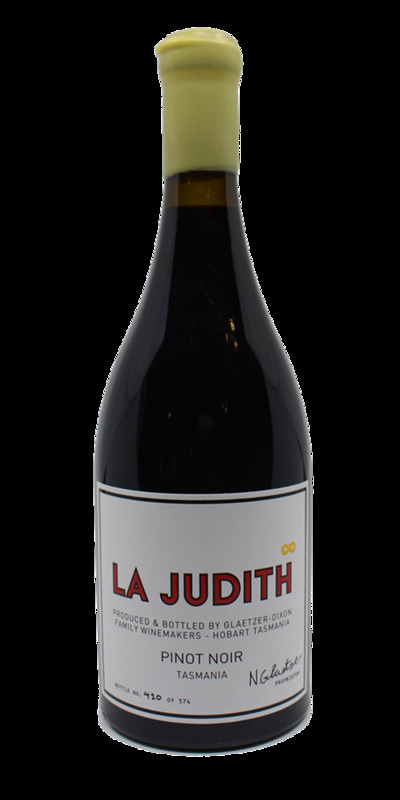 Nick Glaetzer has elevated Tasmanian wine to a new level with the release of the La Judith Pinot Noir. An extraordinary single vineyard parcel of fruit was selected to create this wine in homage to Nick's late mother Judith Glaetzer. Single vineyard Coal River Valley fruit was harvested on 6th April 2013. Yield 15 hl/ha (Grand Cru Burgundy AOC stipulates 35-37 hl/ha). 30% whole-bunch, remaining 70% stems returned to must after destemming. Cold-soak for 7 days followed by inoculated ferment. 5 weeks total on skins before pressing to 100% new French barriques from Cognac cooperage. 34 months in barrel on full malolactic lees. Bottled unfined and unfiltered on the 24th February 2016. Only 574 bottles produced.